Aspalathus agardhiana DC., Aspalathus armata Thunb., Aspalathus exilis Harv., Buchenroedera teretifolia Eckl. & Zeyh. A widespread (EOO 26 921 km²) and still fairly common species, known from recent field observations to remain at at least 20 locations. It continues to decline due to ongoing habitat loss and degradation, but does not yet qualify under any of the five criteria (A-E) for a category of threat. Southern Namaqualand coast to Cape Peninsula. 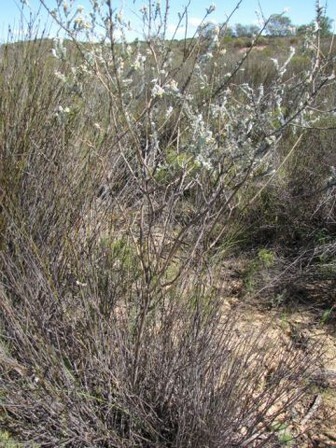 Sandy areas on flats in lowland and coastal fynbos. Many subpopulations on the Cape Flats and Cape Peninsula are now locally extinct due to habitat loss to urban expansion. Urban expansion continues to threaten remaining subpopulations around Mamre and Atlantis. In the Sandveld and coastal sandy flats between Hopefield and Darling, habitat loss to crop cultivation has fragmented the population, with most subpopulations remaining on isolated remnants. Alien invasive plants are outcompeting native species in most remaining sand fynbos remnants between Hopefield and Melkbosstrand. Fire suppression is also a threat to subpopulations in small fragments, as this species requires fire to regenerate. In Namaqualand the main threat is habitat loss to open-cast mining of coastal dunes. 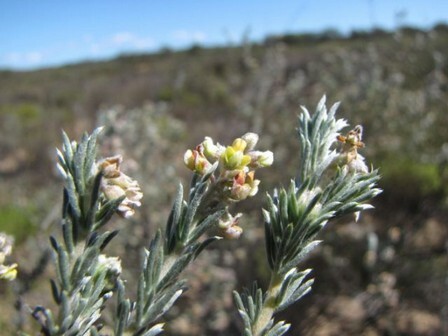 This species' habitat is already more than 45% irreversibly modified, and it has declined extensively in the southern part of its range, where it is now nearly extinct on the Cape Flats. In the Sandveld and on the northern outskirts of the City of Cape Town it continues to decline due to rapid, ongoing habitat loss. Decline is however not so severe in Namaqualand. It is possible that the population has declined by more than 30%, but the timeframe of decline is longer than three generations, as this species is a relatively short-lived reseeder. Subpopulations are often small, but not enough subpopulation level counts are available at present to estimate the total population size, and subpopulations may fluctuate in response to fire. The population is partially fragmented due to habitat destruction, but less than 50% of subpopulations are small and isolated.